Last week, Anne posted a question on her blog asking “what does digestive health mean to you?” Having Ulcerative Colitis, I thought it was important for me to share my experience and comment. So I will now pose it back to my readers, what does digestive health mean to you? Anyone else out there deal with an Irritable Bowel Disease like I do? Eek! Meditation this morning got moved to another room in our house because of a centipede lurking in our spare bedroom. I love spring but I hate the centipedes that invade our house with the warmer temps! I seriously scream at the top of my lungs when I see them. I have a big fear of bugs (spider and centipedes) and snakes. Any bugs that you fear? 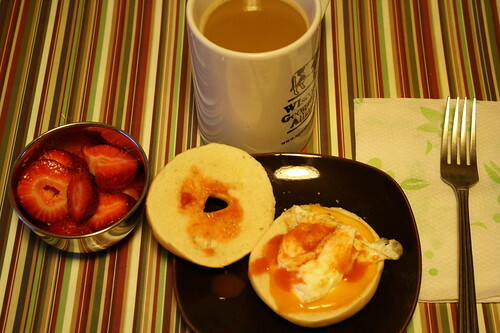 Breakfast was a mini bagel with an egg white, cheddar cheese and Frank’s red hot. It’s kind of killing me to eat these white bread bagels instead of wheat, but I figure they are mini and they have to eaten up! I also paired it with some strawberries on the side. No snack at work (I am trying to cut back on morning snacks), unless you count an almond latte. 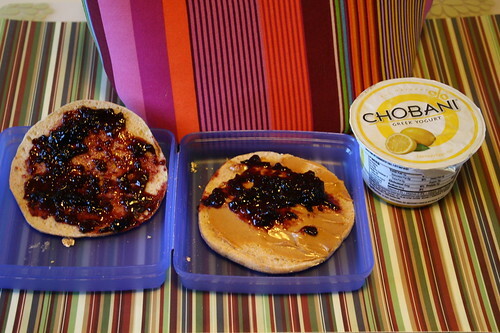 Lunch was a peanut butter and jelly sandwich, a lemon Chobani, some pita chips and another halva. I think I spelled the name wrong yesterday, oops. Sorry about that! 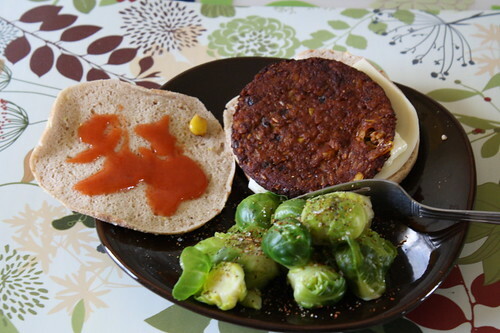 Dinner was a Morningstar black bean burger on an Arnold’s Thin with some provolone cheese and then some brussell sprouts on the side. After dinner, Craig and I went to vote in a local election and the polls were dead. I always feel like I have to exercise my right to vote because of all of the women who fought for this right and won it! Then I quickly changed and got to yoga class. It felt good to practice, per usual. My goal was to get this post out there and done early so I could go read my book, so that’s what I am sticking to. Night! I had lemon Chobani yogurt for dinner tonight. 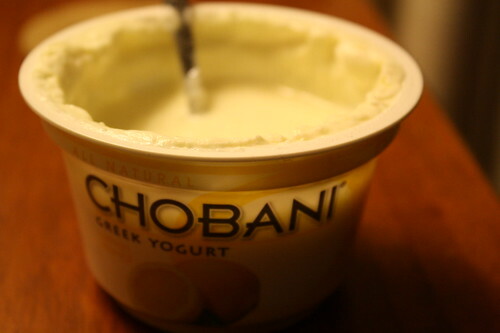 After a gluttonous day (or past couple of days), all I wanted for dinner was a chobani yogurt. It hit the spot. 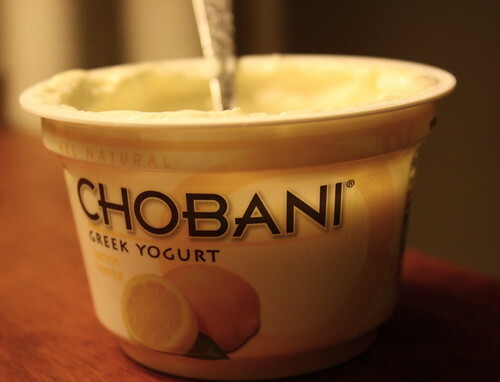 I seriously ate the lemon flavor and said out loud, “I love chobani.” I hadn’t had it for a while because I rely on someone else’s Sam’s club membership to get my chobani cheaper by the case. The lemon flavor was light, airy and just plain good. I find these new flavors to be less thick, but it isn’t necessarily a bad thing. Anyone else experience the same thing? CookinFanatic is hosting a Chobani giveaway–check it out and maybe you’ll get to try out the new flavors yourself. Enter by Friday because that is when she is picking the winner! Time to get to bed and start a busy workday tomorrow. Coming back to work from vacation is never fun, even if I got threw a lot of my e-mails today. Not looking forward to it but I have to remember that I am only one person.